This post deals with the free energy perturbation technique. The free energy change associated with the transformation of a state A to B can be calculated with FEP, a method based on a formulation by Zwanzig in 1954. This transformation is performed by treating the end state B as a perturbation on state A. The potential energy of state B is calculated from a simulation on state A. For such a calculation to be accurate the state B must also be adequately sampled from a simulation of state A, or in other words there must be a large overlap in the potential energy surfaces of these two states. This condition is very rarely fulfilled for two end-states A and B in a chemical transformation. However, as free energy is a state function, it is possible to divide the path along A → B into a series of smaller perturbations through “non-physical” intermediates. The free energy of transforming A to B can then be provided by the summation of each of these small perturbations. 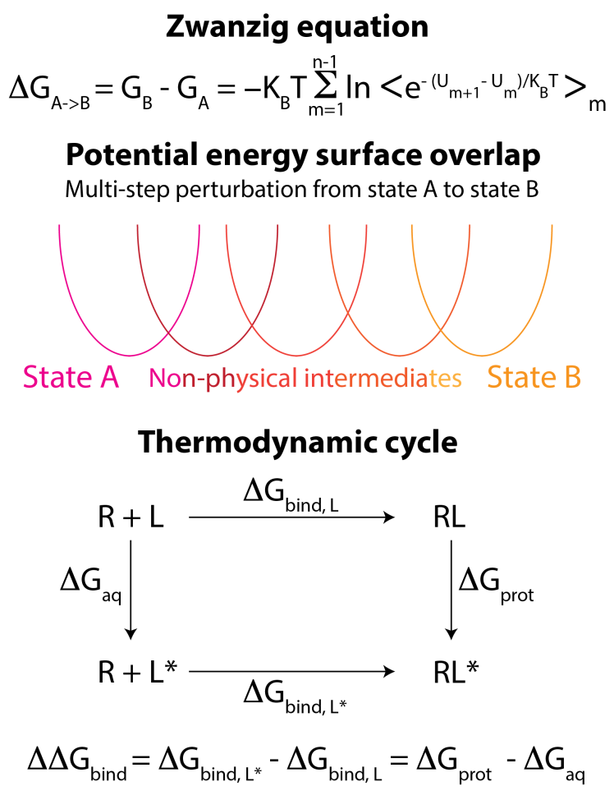 Typically, for biological processes, we use a thermodynamic cycle to calculate relative free energies using FEP as shown above with an example of a calculation for obtaining relative binding free energies of two ligands L and L*. FEP is a powerful tool, which if correctly applied can be used to accurately estimate changes in free energy with high accuracy. The approach also allows for great flexibility in terms of application areas. Our in-house expertise in FEP shall be a key contributor to any project. What we strive to do within the company is harness the large amount of computational power that is available currently in order to tackle the complex landscape that characterizes early-stage drug discovery efforts. Using target-specific protocols, a talented team of computational chemists & biologists, medicinal chemists, and programmers will look to weave together diverse techniques to yield novel lead compounds with desirable properties. © 2017. Quest Compbio Pvt. Ltd. All Rights Reserved.